Montana has always been my home. I moved to Billings from Bozeman to finish my last two years of college. I am actually a registered nurse. 30 years ago when I was pregnant with my first child, I decided to take a quilting class because I wanted to be able to say I’d made one quilt in my life, and I figured once the baby came my chance would be lost! Since then, I have made countless quilts and have had two terrific children, Jenna and Brandon, who are now grown and starting their own families. When I first started quilting, I took a few classes and bought many books. The first award I won was for the first quilt I made, ‘Country Hearts and Homes’. I took first place in my division at the 1986 Western Heritage Center Show. I was so excited… until I looked around and found that I was the only entrant in that division! But still, I was hooked. I learned most of my skills on my own. My specialty has been machine quilting workmanship. The most prestigious award I have won is the Bernina Award for the best machine quilting workmanship, a $10,000 purchase award presented by the American Quilters Society in Paducah, Kentucky in 1993, for my quilt titled ‘One Fish, Two Fish, Red Fish, Blue Fish’. My quilt called ‘Bottled’ was purchased by the YLI Corporation, a thread company that has provided me with a wonderful selection of threads! I have taught for YLI and my quilts have been featured in their ads and brochures. I have written chapters for the Rodale Successful Quilting Library: ‘Fast and Fun Machine Quilting’, ‘Favorite Techniques from the Experts’, ‘Choosing Quilting Designs’, and ‘Creative Embellishments’. Most of my quilts I keep for teaching, but several are part of private and corporate collections. In 1994, I decided to take a chance and give up my full-time nursing position to open a quilt shop, Fiberworks, in Billings. I have never regretted it! I teach locally and nationally, showing students what has worked for me and encouraging them to express their own concepts and creativity in their quilting. Many of my designs are simple, but my use of color and quilting makes them much more interesting! 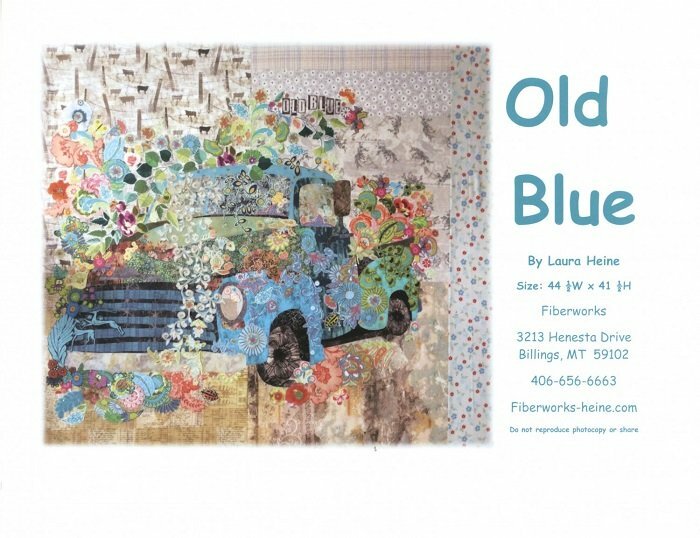 Pattern - Old Blue Vintage Truck Collage by Laura Heine for Fiberworks Inc.